Because the world is getting warmer, permanently frozen ground around the arctic, known as permafrost, is thawing. When permafrost thaws, the ground collapses and sinks. Often a wetland forms within the collapsed area. Conversion of permanently frozen landscapes to wetlands changes the exchange of greenhouse gases between the land and atmosphere, which impacts global temperatures. Wetlands release methane into the atmosphere. Methane is a potent greenhouse gas. The ability of methane to warm the Earth is 32 times stronger than that of carbon dioxide over a period of 100 years. 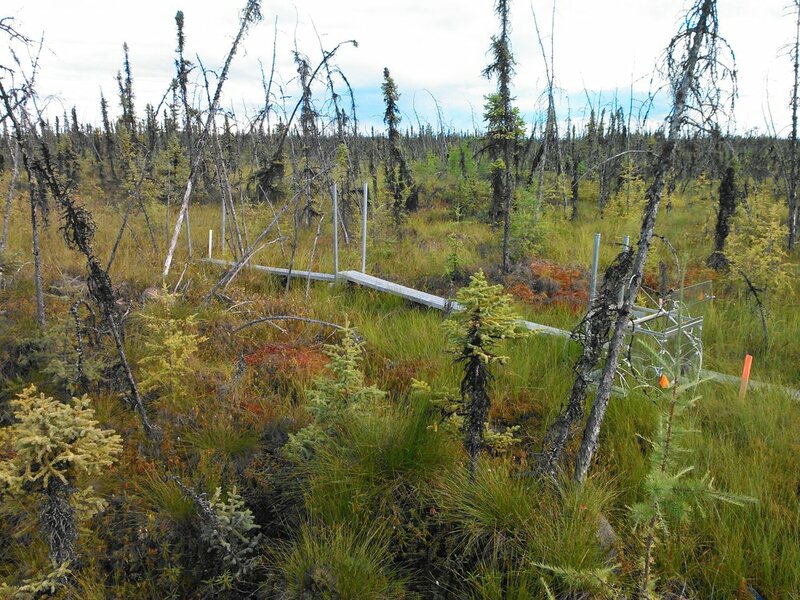 We are studying how wetland plants and climate variables, like rainfall, affect emission of methane from permafrost thaw bogs. We conduct fieldwork at thaw bogs in Interior Alaska and we test mechanisms and hypotheses using plant-growth and other laboratory-based experiments. The project is broadly focused on advancing understanding of how permafrost landscapes in Northern latitudes affect and are affected by climate change. Neumann, R. B., S. J. Blazewicz, C. H. Conaway, M. R. Turetsky, and M. P. Waldrop (2016), Modeling CH4 and CO2 cycling using porewater stable isotopes in a thermokarst bog in Interior Alaska: results from three conceptual reaction networks, Biogeochemistry, 127(1), 57–87, doi:10.1007/s10533-015-0168-2.